Air muscles are available commercially from Shadow Robotics in the U.K. in a variety of sizes. For experimental purposes its pretty easy to make your own air muscle in whatever size you require. The inner tube is made from soft silicone tubing, approximately ¼" OD and 1/8" ID, see suppliers index. Go to a local pet shop that sells aquarium supplies. Purchase a small quantity of PVC clear tubing. (Same size as the silicone tubing, but less flexible and tougher) Pick up a few aquarium air valves and couplings too. Many electronic distributors sell the polyester braided mesh sleeve. 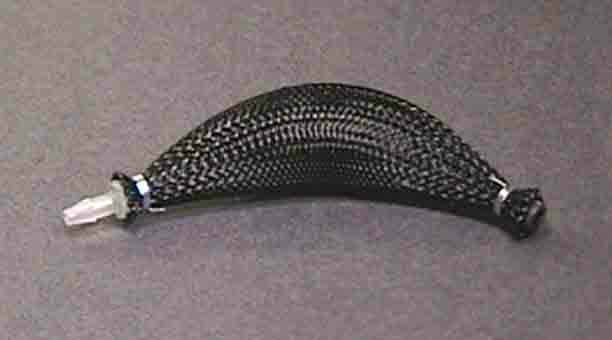 The braided sleeve is used as a flexible conduit for electrical wiring. Purchase a small quantity (6 feet) of 3/8" diameter. Finish the materials purchase with a few 3/8" long 10-24 screws and a small quantity of 24 gauge galvanized wire available at a local hardware store. Cut a 4-inch length of silicon tubing. Insert the 10-24 screw in one end of the tube. Insert an aquarium air coupling in the other end of the tube, see Figure 3. Cut a 7 inch length of 3/8" braided mesh sleeve. 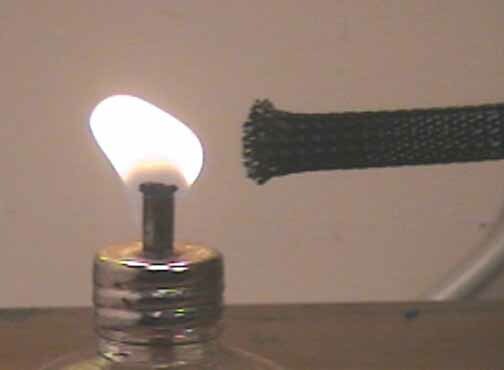 To prevent the ends of the sleeve from fraying and coming apart we singe the ends with a match or candle flame, see Figure 4. The idea here is to just singe the ends of the polyester sleeve, its easy to go too far and melt too much of the sleeve. In that case cut another piece and start over. Insert the rubber tube inside the braided sleeve. Align one end of the sleeve with the bottom of the head on the 10-24 screw in the rubber tube. 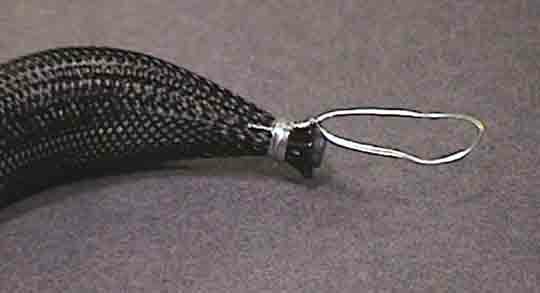 Wrap a piece of 24-gauge wire three or four times around the end, capturing the sleeve, tubing and threaded portion of the 10-24 screw. Then twist the ends of the wire together. Use a pair of pliers to make this as tight as possible. Cut of any excess wire. See Figure 5. To finish the other side, push down the sleeve until it is aligned with the rubber tube on the air coupling. Wrap a piece of 24-gauge wire around this end, tighten wire with pliers then cut off any excess wire. See Figure 6. At this point you may want to pressurize the air muscle to insure the two fittings do not leak. Since the air muscle is not loaded only use a pressure of 20 psi. If any air leaks, try tightening the 24-gauge wire. Cut two 14-inch lengths of the galvanized wire. These we will use to make the mechanical loops. Fold the wire in half to double. Form a 1-inch loop from the middle of the wire and twist the wire at the bottom of the loop, see figure 7. 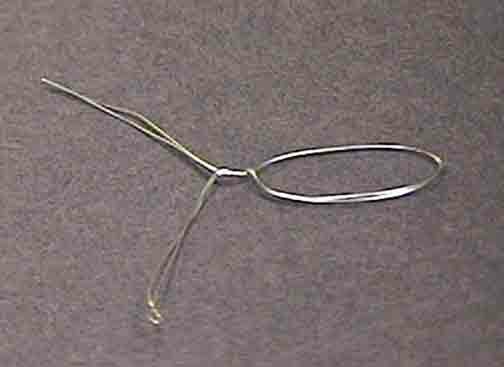 Next wire wrap the loop to the end of the air muscle as shown in figure 8. Do the same to the other side. Pull on the loops to insure that they are secure.